You would like to participate or get more information about the festival? at the Misatango Festival Vienna: Join in! Have you always wanted to combine singing in a choir with your passion for tango? Now you can! A brand new musical experience for tango-loving choir communities is coming to a concert hall near you at the Vienna Konzerthaus. A rare opportunity to take part in intensive rehearsal project, to work with the Argentinian experts and learn the secrets of the stylistically authentic performance of Argentinian choral and instrumental music, culminating in an unforgettable concert experience. We would like to invite you and your choir to celebrate and perform Misatango and the World Premiere of Salve Regina by Martin Palmeri at the Grand Hall of the Vienna Konzerthaus in 2021! The Misatango and the Salve Regina are written by the Argentinean composer Martin Palmeri and conducted by the Argentinean Grammy Award Nominee conductor Saul Zaks. They are choral works written for soprano soloist, bandoneón, strings, piano and mixed SATB choir and share a similar level of difficulty. Both works manifest Palmeri's splendid talent for integrating stylistic features of the tango into his compositions. The marvellous employment of the bandoneón, sometimes as a singing voice, then again as a rhythm instrument, assures the preservation of the "tango soul." It is with excellent melodic and ingenious richness that Palmeri mixes the various tone colors of the tango with the various characteristics of the individual parts of the liturgical text. A hands-on musical workshop and performance where singers and musicians from diverse corners of the world come together to broaden their musical horizons through the discovery of a niche musical genre not otherwise a part of everyday life. The common goal: a performance of Martin Palmeri’s Misa a Buenos Aires or “Misatango” – a rare and exciting combination of Tango, choir and orchestra, and the World Premiere of Salve Regina. The choir will study the music prior to the workshop, the conductor Saul Zaks will lead the project, devoting himself entirely to the unique stylistic detail of the music, equipping the singers with the authentic performance techniques of this Argentinian music and perfectly blending choir, chamber orchestra and soloists to evoke that unmistakable Argentinian essence on stage. The second aim of this workshop is to coach choir conductors and singers in the unique style of conducting Argentinian a cappella choral music together with composer Martin Palmeri. “This are essentially religious works with dramatic elements,” composed by the international prize-winning composer Martin Palmeri. "Misatango" is - as all traditional masses are – in Latin, and offers a breathtaking emotional and musical scope which, in spite of the traditional elements, is highly original. There are fugues in the Kyrie, traditional church music elements in the Gloria, The Tango Nuevo seems to resonate Piazzolla-Style in the Credo while a solo soprano sends shivers down the audience’s spine during the Sanctus, all consummately embellished with the often reticent yet unmistakable voice of the bandoneon to make this Argentinian Misatango a masterwork of Argentinian stylistic perfection. Prior to the workshop, the choirs will rehearse the pieces intensively with their own conductors at home. During the workshop at the Vienna Konzerthaus, the conductor Saul Zaks and the composer/pianist Martin Palmeri will rehearse with both the choir and the choir’s conductor in order to perfect the stylistic detail required when performing Argentinian music with authentic Argentinian flair. Rehearsals of the complete works - both the Salve Regina and the Misatango -, together with the prize-winning Youth Chamber Orchestra ‘Violinissimo’ will also take place. 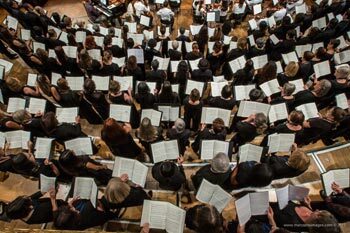 Parallel to this, the choirs and their own conductors will together perform a short selection of pieces from their repertoire in the first part of the concert at the Vienna Konzerthaus. The second half of the concert will consist of the Misatango and the Salve Regina in its entirety, conducted by Saul Zaks. The Youth Chamber Orchestra Violinissimo and Martin Palmeri as soloist at the piano, Argentinean soprano Carla Filipcic Holm and Argentinian bandoneon player Pablo Mainetti will all be united on stage in an unforgettable Argentinian concert experience. We will be in touch to discuss your needs, wishes and requirements. We look forward to hearing from you!